- Grommets Holes are placed every 2-3 ft.
- Banners are shipped in UPS Certified Strength Mailing Tubes. If your Banner bleeds off the outside edges, please make sure to create your artwork so that it is 1/2" larger than the ordered banner size. 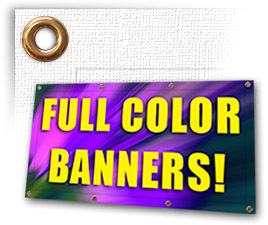 (1/4" bleeds on all sides) EXAMPLE: If you order a 4 ft. x 8 ft. banner, create your artwork to be 48-1/2" x 96-1/2". It is recommended to have your Banner edges Heat Weld Seam Sealed when you are adding Grommets for Hanging, and the Banner is going to be used outdoors for a considerable length of time. The Heat Weld process is taking the edges of your banner and folding back 1" of material to the backside of the Banner, and using a high Heat Welding process to make a seam creating 2 layers of Banner Material. This two layers of Banner material creates excellent strength and stability to punch the Grommets Holes through adding strength for hanging outdoors. If your Vinyl Banner is being used for short-term indoor usage there is no need for Heat Weld Seams, as the one layer of banner materials with Grommets will hold up adequately. - Call for Quantities above 15 for Special Pricing and Turnaround Times. - Orders placed and digital files approved by 1:00 p.m. EST sets your Turn Time. UPS SHIPPING TIMES Get "REAL TIME" UPS shipping rates directly in the pricing calculator. Sorry, there are no templates for this item.